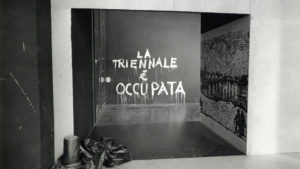 A show to relive the occupation of the Palazzo dell’Arte during the XIV Triennale exhibition. Telling the stories of the city of Milan through archive material has become the trademark of the duo composed by Gianni Biondillo and Painè Cuadrelli. 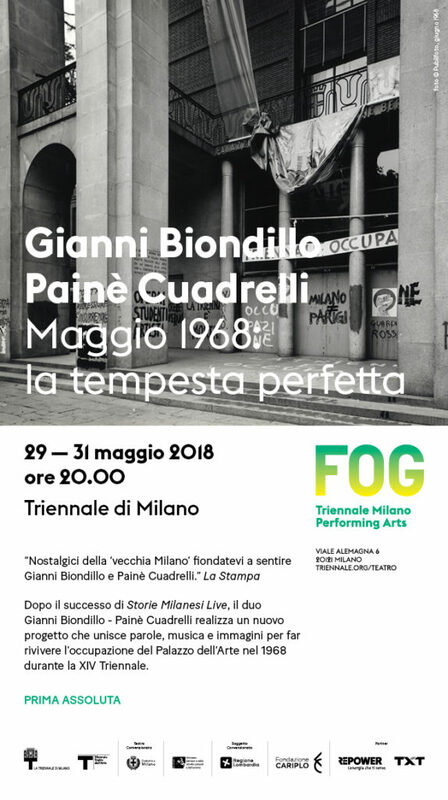 After the success of Storie Milanesi Live (2017), FOG presents the world premiere of Maggio 1968: la tempesta perfetta, a piece which brings back to life the occupation of the Palazzo dell’Arte during the XIV Triennale. This was an exhibition visited by very few, despite the prestigious names in the programme, including authors, artists and architects. What has remained in the collective memory is the taking over of the museum building by factory workers, students and artists on the opening day. The performance is a multidisciplinary project in which storytelling meets theatre, music and video projections to guide the audience through the frenzy of the ten days that marked a new way of engaging with the contemporary world. Gianni Biondillo is a traveler, author and architect has been publishing for Guanda since 2004. He is known for his mystery novels with Inspector Ferraro. During these years he has written about various subjects such as architecture, psycho-geography, travels, eros and fairytales. In 2011 his novel I materiali del killer received the Premio Scerbanenco-La Stampa and the Prix Violeta Negra in France. In 2016 he published a history novel on the Futurists called Come sugli alberi le foglie. He writes for both cinema and television, he is part of the editorial staff of “Nazione Indiana” and publishes regularly for various daily and national press outlets. His works have been translated in various European languages. Painè Cuadrelli is a musical producer, sound designer and dj, active in the field for more than 20 years. He is a reference point when it comes to Italian electronic music and the relation between sound and media. From his studio in Milan he composes and produces music for films, documentaries, installations, exhibitions, runways and communication projects. He has collaborated with national and international radio stations producing various programs. His projects also include working on combinations between electronic music, mixed-media and sound memory through collaborations with various institutions, museums, fashion and design companies. He has produced three albums Simplemente Asì, Spontaneous, Hey Presto! for the label Right Tempo as well as collaborated with international artists on creating remixes (Soslo, GaMaPaWa). He is the coordinator of the Sound Design major in IED Milan where he also teaches. He is the founder and artistic director of the mixed-media platform Compl8 Produzioni through which he produces discs, multimedia content and other musical initiatives.